It is time for business in Rabat, Morocco, where members of the Super Eagles have assembled to prepare for Friday’s Russia 2018 World Cup qualifier against Algeria and next week’s international friendly game with Argentina. Nigeria will meet Algeria in the dead rubber qualifier in Constantine on Friday and fly to Krasnodar, Russia for the friendly with Argentina on November 14. To plug the holes created by the injury forced withdrawals of Ogenyi Onazi and Moses Simon, Coach Gernot Rohr has invited Chelsea loanee, Kenneth Omeruo and Kayode Olanrewaju of Girona FC of Spain to join the squad. According to the Nigeria Football Federation (NFF), members of the technical crew and backroom staff arrived in Rabat on Sunday, alongside four players, Ahmed Musa, Wilfred Ndidi, Mikel Agu and goalkeeper Ikechukwu Ezenwa. The federation revealed that Oghenekaro Etebo, Alex Iwobi, Olanrewaju Kayode, Henry Onyekuru, Chidiebere Nwakali, Kelechi Iheanacho, Uche Agbo and Chidozie Awaziem arrived in Rabat yesterday.Omeruo, John Ogu and Anthony Nwakaeme also arrived at the Golden Tulip Farah hotel camp of the Super Eagles yesterday. “Team administrator, Dayo Enebi Achor confirmed to thenff.com that team captain Mikel John Obi, as well as goalkeepers Francis Uzoho and Daniel Akpeyi, are expected in Rabat today. “The Super Eagles, with the Russia 2018 World Cup ticket already in their pocket, will fly to Constantine, where they face the Fennecs at the Stade Mohamed Hamlaoui from 8.30 p.m. Algeria time on Friday. “On Saturday, the Nigerian team will fly aboard a chartered flight to Krasnodar, the Russian city that will host Tuesday’s international friendly against Argentina,” the statement said. 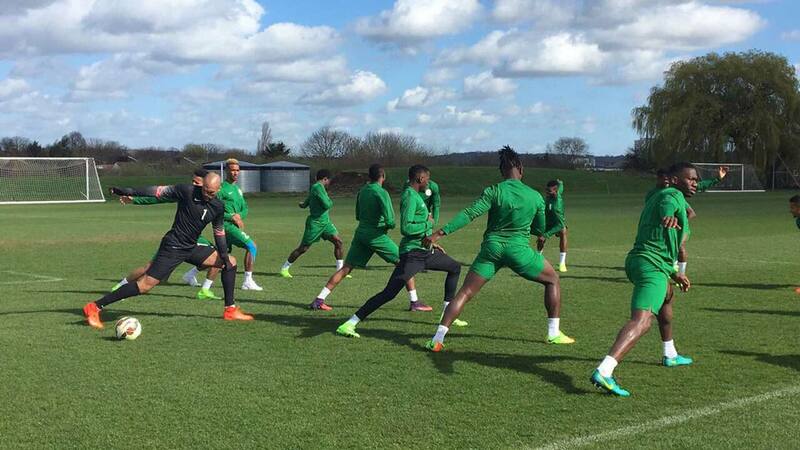 Coach Rohr is using the games against Algeria and Argentina to test some of the fringe players in his squad and also give some others, who have not had a look in into his team the opportunity to stake their claim to the squad billed for the Russia 2018 World Cup scheduled to begin in June next year.The NFF has already started shopping for s suitable camping site for the team in Russia, where the Super Eagles will conclude their final preparation for the World Cup at the end of the European season in May.